I am busy preparing for my IFBC trip but wanted to leave you with a quick thought today. What are you working toward today? I have a lot that I work toward every day but this reminded me that it’s not all about getting there – it’s about the journey to get there, and at least I’m a little closer today than yesterday. 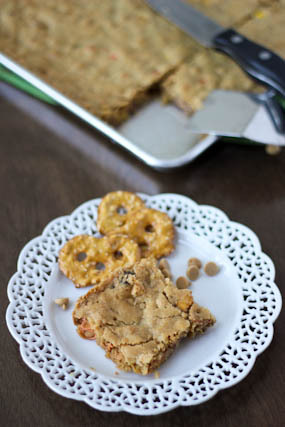 Don’t miss these: peanut butter pretzel overload bars. I still can’t get enough sweet and salty! I LOVE that quote. 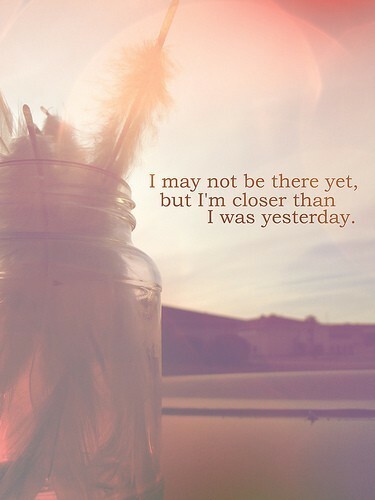 I always have to remind myself that it takes a lot of chipping away to get where I want to be. I seriously have to remind myself of The Shawshank Redemption, where it takes him years to dig a tunnel in the wall, but he finally makes it. Love that quote, Cassie! Thanks for the reminder that each small step is still a step forward :). I DID miss those bars Cassie. They look outstanding. Have a great day! Awesome quote, Cassie! I am working toward my life goals today, little by little, and as stressful as it is, I’m focusing on the big picture, which is definitely the most important! That quote is so relevant to my life right now. I feel like I’m working very hard, all the time, to attain a dream that might be far fetched but I know isn’t impossible. Because nothing is impossible. I love your little inspirational quotes! I always have to remind myself that life is a journey, and to just enjoy it one day at a time. Patience… it’s something I’m still learning.. Safe travels, my friend…I’ll take this quote to heart. That’s a great quote! Have SO much fun at IFBC!